For many years, companies have been outsourcing certain tasks in an effort to improve the organization's operations. Whether the desired outcome is increased profitability, better customer service or greater operating efficiency, the overall goal is typically to give the company a competitive edge. The precise reasons for choosing to outsource a project vary by company. The company's goals, staffing and budget are some of the most common reasons given for outsourcing. Despite the success that many organizations have realized through outsourcing, however, there are still a number of myths that deter companies who have never engaged in the practice. Myth: The only reason to outsource is to save money. In reality, outsourcing will probably provide you with significant savings when compared to the cost of in-house software development. However, there are many other valid reasons to outsource, including access to experienced developers with specialized skill sets, faster deployment, superior quality of the product and enhanced efficiency. Myth: You relinquish control over your project. You can be just as involved with your project as you choose. You can offer suggestions, conduct periodic progress checks or provide feedback whenever you wish. With delaPlex, you can communicate directly with the dedicated team working on your project via email, Skype or a variety of other methods. You can establish a working relationship with your team that can allow you to be involved in your projects to virtually the same degree as if your project were being completed in the same building as your office. Myth: Language and cultural differences will hamper your project. Admittedly, during the early days of outsourcing, language skills were lacking among certain providers, and in some countries, cultural differences also impacted progress. Today, reputable outsourcers go to great lengths to recruit personnel possessing not only the best technical skills but also those who are fluent in English. If these employees lack the skills to deal with cross-cultural exchanges, the outsourcer will ensure that they receive any training needed. 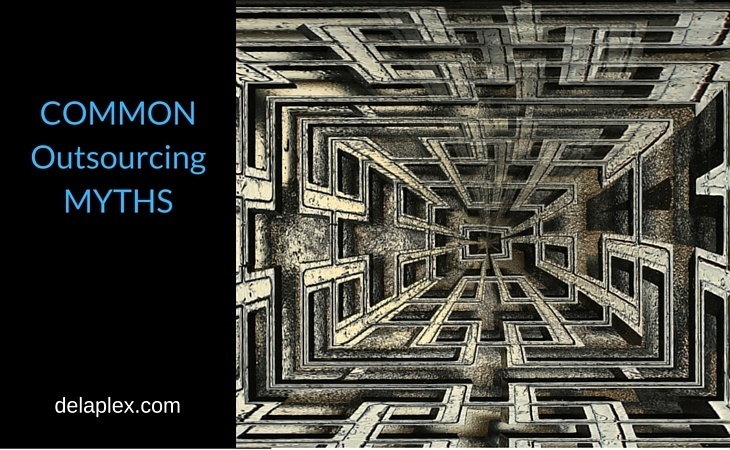 Myth: Offshoring is the same as outsourcing. Although many people use the terms interchangeably, they actually represent two very different concepts. Outsourcing means that you are delegating work to a third-party provider. Offshoring means that you are moving some or all of your business efforts to another country. With outsourcing, you do not need to physically relocate your offices, staff, production plant or any other part of your business. You conduct business as usual, but the specific project you have chosen to outsource will be handled by a third party. Myth: Only large corporations outsource. Large corporations may have made the most efficient use of outsourcing, but small businesses stand to gain even more benefits. Small organizations and fledgling business can leverage outsourcing to allow them to become more competitive through faster deployment. Smaller organizations often lack personnel with the skills to develop their projects, and they may not have sufficient budgets to permit the hiring of additional staff. Instead of focusing on recruiting or supervising a project, owners and managers of small organizations can focus on growing their business, interacting with customers and other core functions. Myth: Outsourcers have nothing to offer other than the actual project. Your outsourcer can provide you with information that might be valuable to you. For example, outsourcers must remain current on trends, new technologies and improved methodologies. When you propose a project, your outsourcer can advise you of the best way to accomplish your goal, which could save you from a costly mistake. In addition, outsourcers often know of new opportunities that could allow you to increase your share of the market or improve your profitability. Myth: Outsourced projects are more prone to security breaches. On the contrary, software developed by an outsourcer is likely to be more secure than a similar product developed internally. Outsourcers take security very seriously, so they stay abreast of vulnerabilities, viruses, methods of hacking and other areas that could expose the projects developed for clients to unnecessary risks. They must also remain current on the requirements for regulated industries to ensure that all software they develop is in compliance. Encryption, employee non-disclosure agreements, superior firewalls and physical security are just a few of the routine measures practiced by outsourcers to ensure data security. Myth: All outsourcers are the same. This is a bit like saying that all athletes are the same. Some athletes can run faster, jump higher or throw more accurately than others can; some specialize in a single sport or position, but others are more versatile. Regardless of profession, you can always find those who are superior or inferior to others. Myth: Outsourced IT projects are of lower quality. Myth: The time difference presents a major problem as programmers are just starting work when you are ending your day. Different phases of your project may require different levels of communication. However, once you decide on a process that works for you, you can leverage the time difference to create an operation that runs day and night. While you get a good night's sleep, your outsourcing team in India can continue developing your project. At delaPlex Software, we believe that we have earned our reputation for providing a spectrum of services that deliver superior results. We utilize a blended approach to ensure the best coordination, such as having a project manager and other key personnel onshore and providing you with a U.S. telephone number you can call whenever you have questions about your project. We provide you with a customized, dedicated team by combining offshore and onshore resources that possess the right skills for your business needs. Team members will take the time to get to know your product and your business goals. Our employees have the most current skills, and all of our staff members are fluent in English. Contact us today to learn how we can help you achieve your business goals, mitigate your risks and realize the greatest return on your investment.